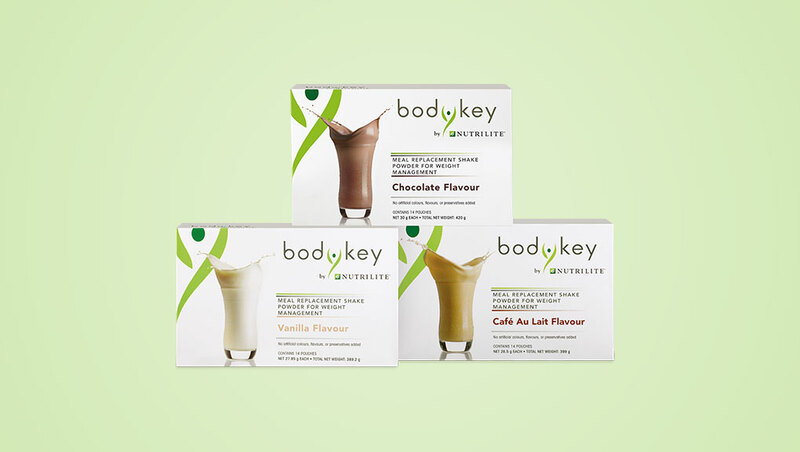 BodyKey by NUTRILITE Meal Replacement Shake is the #1 meal replacement shake globally that contains no artificial flavours, colours, sweeteners, or preservatives. * Designed by NUTRILITE to integrate with the programme and meal plan for best results, it only contains 112/116/118 calories (depending on flavour) without adding milk! Containing about 25 vitamins and minerals, it provides you at least one third of your daily nutritional needs while controlling your calorie intake. It contains more fibre (5 - 6g, depending on flavour) to keep you feeling fuller for longer and to support your digestive health. Exclusive “BodyKey IDEAL POINT” taste mapping technology ensures a delicious low-calorie meal packed full of nutritional goodness! A convenient way to control portion size while meeting the body’s nutritional requirements. When mixed with 250 ml of skimmed milk, the BodyKey by NUTRILITE Meal Replacement Shake helps keep you feeling fuller for longer, maintains lean muscle mass and supports digestive health. Available in three delicious, natural flavours - vanilla, chocolate & cafe au lait. Suggested Use: Mix one pouch with 250 ml of skimmed milk (or soya bean milk). Add fresh fruit and/or vegetables to create your own individualised BodyKey by NUTRILITE Meal Replacement Shake. Clinical studies have shown that the use of meal replacement shakes twice a day as part of a structured meal plan along with moderate exercise is effective for managing weight. *BodyKey by NUTRILITE Shake limited to powder form, Global Brand rankings based on: Source Euromonitor International Limited; Packaged food, Meal Replacement Slimming, UBN, Retail Value RSP, % breakdown 2014. © Copyright 2018 AMWAY (B) Sdn.Bhd. and AMWAY (MALAYSIA) Sdn.Bhd | All rights reserved.